When we hear the name, Bing Crosby, we think of his smooth, jazzy voice singing “White Christmas”. Being that it is that time of year, we chose the single “White Christmas” as performed by none other than Crosby as our Featured Vinyl of the Week. Written by Irving Berlin, “White Christmas” is the best-selling single of all time. 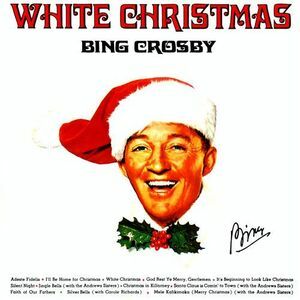 Bing Crosby’s version has sold over 100 million copies. On Christmas Day in 1941, “White Christmas” was performed for the first time by Bing Crosby on the NBC radio show The Kraft Music Hall. A copy of the recording was kept by the Crosby estate. Due to its popularity, White Christmas proved that there could actually be commercially successful Christmas songs. The only single that hit #1 on the charts 3 different times, “White Christmas” hit the top of the charts again during the holidays in 1945 and 1946. However, before October of 1942, the song did not perform well. Another single from the musical film, Holiday Inn, called “Be Careful, It’s My Heart” ruled the charts. “White Christmas” finally topped the “Your Hit Parade” chart and stayed there until early 1943. The single spent over 11 weeks at the top of the chart. In 1942, the song won an Academy Award for Best Original Song. With so much imagery in the song, it brings feelings of nostalgia to a lot of WWII veterans, dreaming of a white Christmas when they were away from home. Played in malls, movies, and homes all over the country, the song “White Christmas” sung by Bing Crosby, is a truly original Christmas song that makes listeners feel the magic of the holidays and helps us remember what Christmas is all about.